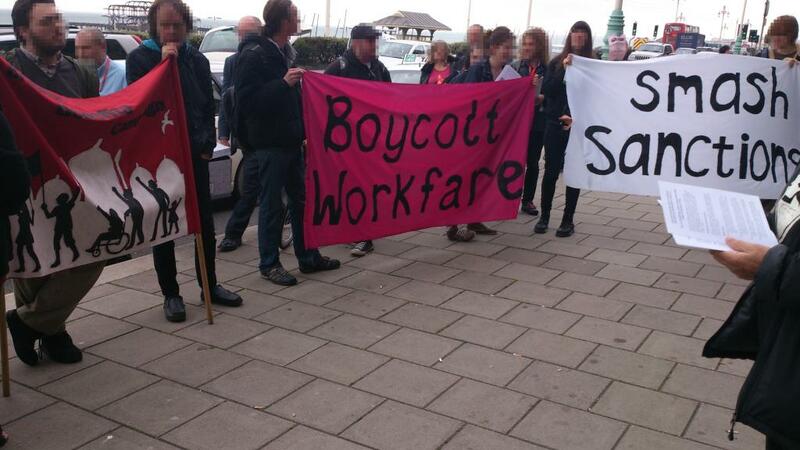 In writing this I am “helping the Tories,” if the nonsense aimed at Boycott Workfare of late is anything to go by. They raised the question of PCS members in the Department for Work and Pensions refusing to sanction claimants, which is apparently highly divisive and has the government rubbing their hands with glee. You can see why. After all, the entire foundation of working class solidarity is built on the principles of not criticising tactics on Twitter and refusing to have serious debates on strategies for the class struggle. If only we stopped having slanging matches online, the class would rise as one and we’d be living with full communism now. Or, at least, Boycott Workfare wouldn’t busy themselves with trifles like bringing the pressure to bear that put workfare so close to total collapse and would engage in the more productive activity of cross-country hikes with banners like Youth Fight For Jobs, one of their recent detractors. So I’m divisive as all hell. But before the mere act of writing these words brings the entire left crashing down and ushers in the age of Super Robo Tories, I’m going to explain why those responsible for implementing government policy can fight attacks on claimants at the source. Moreover, it’s absolutely necessary for us to have a hope of winning. This is a poorly constructed straw man and its implications are offensive. Claimants who get angry about sanctions are just over-emotional and have their judgment clouded. Pointing out the real harm and human suffering that sanctions cause every day (at least if you use it to suggest workers shouldn’t sanction) is apolitical moralising. None of you criticising PCS know the politics of the situation like McInally does, so shush and be told. But the fact that this is a political issue is the point. We aren’t facing such extreme attacks at present because the Tories are nasty, or the bankers are greedy or (McInally’s chosen gambit) Labour are spineless. We’re facing it because the ruling class feels confident that they can get away with it, one element of which is a largely acquiescent and constrained trade union movement. The conditions that allowed the creation of the NHS and expansion of the welfare state after World War Two aren’t there any more. This not only makes some kind of Keynesian settlement unlikely but also underlines the need for direct action if the working class is to win concessions. Such direct action, it shouldn't need saying, cannot be limited to periodic strikes on purely industrial demands. Rather, because this is a political struggle, it follows that the action we take must be political. It's all well and good to say that "PCS is fighting for coordinated industrial action across the public sector" but even if the key demands of the union's national dispute were won this wouldn't necessarily help claimants. They are purely industrial in nature. Another major problem with dismissals of the calls for non-cooperation is the narrow workerist worldview it represents. Namely, the view that everyone must fall in line behind the trade unions and the interests of other sections of the working class must be subordinate to those in work. It is all well and good for McInally to say that any campaign must be "driven by the TUC and based in the trade union movement." But, as Johnny Void points out in his own response to this subject, "that’s the same TUC who support benefit sanctions (PDF 3.60 pg 31) and have recently been a named supporter of a week celebrating unpaid work." Meanwhile, Youth Fight For Jobs have a policy which looks suspiciously like the Labour Party's compulsory jobs guarantee, or minimum wage workfare. The arguments against non-cooperation essentially fall back on slogans. But coordinated strike action, including the vain hope of the TUC calling a 24 hour general strike, isn't ruled out by this strategy. Indeed, it would compliment it. As would direct action by claimants, however much the old left views actions by those outside of work to be little more than the strike's poor cousin. Some say the trade union movement shouldn't represent certain groups of workers like prison officers, police, army and this argument is being extended to civil servants and especially those in the DWP. Any socialist would reject that argument. Wherever workers are organised it's the job of the trade union movement to fight over issues like pay and conditions, but also to win the workers to the ideas of our movement including decent social security. I'm not going to rehash my thoughts on the police or prison officers here. Needless to say, if you don't get why those whose function is primarily and inextricably rooted in the oppression of our class then you might want to re-evaluate why, as a social democratic statist, you choose to use the label "socialist." More relevant to the matter at hand, that argument is not being extended to civil servants. The primary function of front line Jobcentre staff is to administer welfare. This is not inherently oppressive or about policing the unemployed, but has been made so with the policies of successive governments. If there was, then the argument about police and prison officers could be extended to them that their job is reactionary in its entirety and they're not worth bothering with. Instead, workers are being asked not to cooperate with the reactionary and oppressive elements of their role; namely sanctions and putting people on workfare. The reason that the Socialist Party try to argue they don't need to do this (that culpability comes ultimately back to the government's policies) is in fact the primary reason why they can do this instead of being written off entirely. The other element of the argument against non-cooperation is that those who attempt to do so will simply be sacked and replaced with a more compliant workforce. If we gave an instruction not to implement, the government would declare the action illegal. They would have no hesitation in sacking people and therefore driving to replace a union organised workforce with a non-union workforce. One element of this is true. Specifically, unlike strike action, there are no legal protections for action short of strike. If a worker in taking such action is viewed to be refusing a "reasonable management request" then the employer can discipline them, up to and including dismissal. This point shouldn't be glossed over, but nor does it automatically end the debate. The first recourse for workers would be to argue that in fact the request to sanction is unreasonable. How can they be disciplined for not meeting targets when the government insists that those same targets don't exist? Or, from an industrial dispute point of view, why should workers be expected to undertake an action which puts them at increased risk of attack by disgruntled claimants? Either, we must be confident that ALL members will be willing to participate in non cooperation, and that they will also be willing to escalate the action in the event that any individual member anywhere in the Group is subjected to detriment by the employer as a result. management instructions that members are asked to refuse to follow, for example by using the evidentially discriminatory nature of the policy. Clearly, then, non-cooperation is not as McInally suggests simply a matter of instructing members. It requires intensive organisation, winning workers around on the political argument and taking robust action in defence of anybody who is victimised by the employer. This will not be easy, but nor is it impossible. Indeed, it's pretty much what workplace organisation is all about. Returning to the point of the government declaring the action illegal, this would only be the case if PCS explicitly called political action in opposition to workfare. The government could not seek an injunction over the tactic itself if it was under the banner of a lawful trade dispute with a proper mandate through a ballot. This is the very basis of the limited motion on non-cooperation with sanctions passed at this year's conference. Political action under an industrial banner is also how, as Youth Fight For Jobs put it in their rebuttal of non-cooperation, "PCS have always balloted over pay, jobs, pensions, and conditions; i.e. cuts and austerity, to broaden the struggle out as much as possible." To repeat, action to resist the implementation of sanctions is by no means straightforward. But nor is it impossible or undesirable. In fact, by successfully disrupting the functions of state in order to stop or slow specific attacks, workers gain confidence in their own collective strength. It will also help combat the real divisions between workers and claimants, i.e. antagonisms across the Jobcentre counter rather than tactical disagreements on Twitter, and build a genuine, practical solidarity. Meanwhile, the supposed fighting left leadership of the trade union movement needs to give over with their condescending, petulant demands for claimants to shut up and fall in line. When was it not so? The "Socialist Party" mentioned here is the aptonymed "Socialist Party of England and Wales" aka SPEW/Socialist Alternative not the Socialist Party of Great Britain. Trotskyists not socialists.